In the past couple of weeks I’ve been asked several times by different people how to get started working from home. I don’t hold much back when it comes to that. I’ve told you exactly how I’ve found my jobs, what works for me, and even how much money I make. It’s taken me two years to get to where I’m at today and I still have a long ways to go. With the recent influx of new blog readers I’m thinking that I might be leaving the wrong impression. I don’t have the secret sauce to making money on the internet. Because there is no secret sauce. There’s no easy way to do it. This post isn’t meant as discouragement I just want to let you know what it really took for me to be able to do this. Please listen to me – there is NO fast way to earn money and any place you see promising that you can earn hundreds of dollars a day with easy work is a flat out scam. In reality, my back was up against a wall after I got divorced and I had no other choice than to make this work. When I first got divorced I worked two day jobs. My main job was working as an insurance agent and my second job was doing bookkeeping for a department store. I worked at least 50 hours per week just on those two things. It was frustrating. Both were dead end jobs. I didn’t have a college degree and I live in a very small town with no other options. So, I decided to start a side business. I started this blog first (in October of 2012) and then I began working on getting freelance writing jobs. 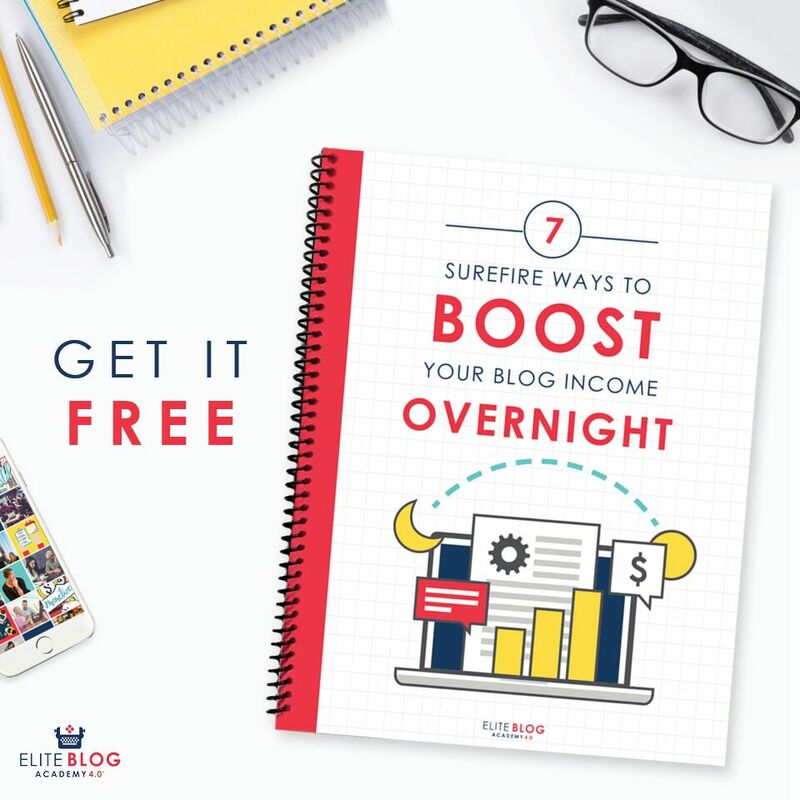 How to Start a Blog + 5 PROVEN Ways to Earn Money Blogging – This post includes a discount code for GoDaddy (my favorite host) and will walk you through setting up a blog for only $12 for your first year!! How to Find Freelance Writing Jobs if You’re Starting From Scratch – Step-by-step, this post will walk you through everything I did to build an online freelance writing business. 50+ Legit Work From Home Jobs – Not interested in becoming a blogger or freelance writer? No worries! Check out this post for many other ideas. In addition to working 50+ hours a week at the day jobs I worked another 20-30 hours per week on my blog and freelance jobs after my kids went to sleep and on the days they were at their Dad’s house. After one year of working those two day jobs I was making enough money from my freelance business to cut back to only my main insurance job – that was in April of 2013. By October of 2013 I was making enough money from my freelance business to go full time. Yes, I went full time freelance in October of 2013 but that was NOT because I was making good money. The only reason I could do it was because my expenses were so low. When I got divorced in the summer of 2012 I took out a $10,000 loan and bought a trailer instead of renting or buying a house. The payment was only $226 a month and I paid off the loan earlier this year bringing my total housing costs to 0$! I also saved an emergency fund with around six months’ worth of expenses before I quit. There’s no way I’d ever put my family’s financial stability in jeopardy because I’m sure you already know, being single means you depend on you and you alone. 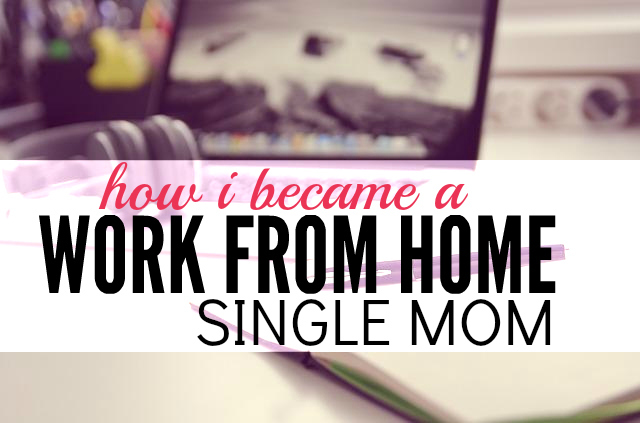 I’m not sure how to phrase this right – I am not a stay at home mom I am a work from home mom. My kids are either at school (my oldest), at the babysitter (my youngest), or asleep when I work. 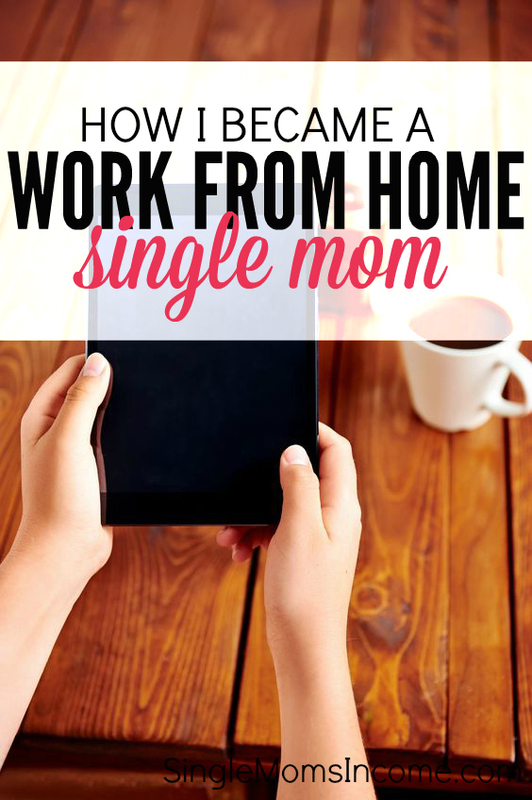 I never set out to earn money online so that I could be a stay at home mom. I did this because a)there is no ceiling on the amount of money I can earn – it all depends on me and b)I like what I do far more than any day job I ever worked! Plus, I set my own hours. If I have a sick kid I don’t have to worry about missing work to keep her home. I can get my oldest daughter on and off the bus every day and take her to school whenever I like. That to me, is priceless. And to be honest I personally would feel like a horrible mom if I did keep my kids home. I don’t want to be that Mom who is always saying “just a minute.” When I’m with my kids I want to be present. And when I’m working I want to work. I don’t want to divide my attention between the two. There is absolutely, positively no way I could make this work if I didn’t take my kids to the babysitter. Another reason my kids go to the babysitter is because this is hard work! I would not be able to get anything done with them home. I work much, much harder at this than I ever did at a day job. This isn’t easy. It is work and you have to treat it like that. Becoming a work from home single mom was not easy by any stretch of the imagination. I had no one else’s income to back me up. I don’t get child support or alimony. To be able to pay my bills without any help I have to work hard. Working two day jobs, trying to adjust to becoming a single mom, and working on building my own side business took a lot of blood, sweat, and many, many tears. I had very thin skin when I first started. The rejections got to me. Negative blog comments got to me. Being overworked and underpaid got to me. I had plenty of bad days where I was ready to throw in the towel but THANK GOD I didn’t! Now I can earn more money in half the amount of time ($5k-$6k/month working 20-30 hours per week) but it took a while to get to this point. Don’t expect to throw up a blog and have people come to you asking you to work for them. Don’t expect to throw up a blog and make money. If you want to work from home and earn more you certainly can but you have to be willing to put yourself out there. To be willing to look dumb. To be willing to be told no. Because all of those things will happen. There’s no magic sauce. You can’t make thousands of dollars a day posting ads or stuffing envelopes. You have to work hard but in the end it is soooo worth it. I want you to know that you can do this. But if you’re expecting magic results you’ll throw in the towel after a couple of weeks. If you want to improve your family’s financial situation (and life) then you’ll have to make yourself get through those hard times. Put in the work. In the end you will be so, so grateful that you did! Previous Post: « When Your Kids Just Won’t Listen….. Thanks so much Julie. You made my day 🙂 You can definitely find ways to supplement your income. Pick something you enjoy doing and really devote yourself to it. One of my biggest problems is jumping from project to project. I’ve just recently made myself focus and it’s paying off already. This is a awesome article for all newbie bloggers to read. I am a single mom and I plan on becoming a freelance writer to supplement my income once I retire from the military. This post makes me realize that it’s not going to be easy, but its very possible. Thank you. You’re amazing! You can definitely do it. Just don’t give up. It’s so easy to look at the people making a ton of money online without realizing the time it took them to get there. Persevere and it will happen! For as long as I’ve been reading your blog I never get tired of hearing this story. I think the new readers as well as the older ones can each take away something from your example of sacrifice and perseverance. Been there when you worked your 2 jobs and look at you now? I am so proud of what you have done, Alexa. Thanks for the reminder to just keep going! I’ve brought in $120 for two months in a row with freelance writing, but I’d like for it to be much higher. I know it takes time and work, so this helps keep everything in perspective. It definitely takes time. Don’t give up! Plus some other doors might open up for you down the road. I was lucky to come out of divorce without any debt and other than the trailer loan I didn’t take on any more. Plus I live in a VERY low cost area – rural Ohio! so I think that’s something to take into consideration. If I lived in a big city my budget would be much, much higher. Wise advice! You are an inspiration! Alexa, you’re a WAHM! Work at home Mom! I think that’s the term you’re looking for? I’ve been reading your blog for a while now, and you are KILLING it, lady! I never get tired of hearing your story either – you’re an inspiration to lots of people, not just people with kids (although of course that makes it even more challenging and awe-inspiring). I’m glad you didn’t let the negative comments get to you! Thanks, Melissa! When I say WAHM I feel like I sometimes get a little flack because I take my kids to the babysitter 🙂 But I think WAHM sums it up. I’m a newer reader of yours and I’m happy that you posted this to say that working online is still working. Loving the site! Thank you so much! And it’s been awesome connecting with you. I know that you have the potential to go very far! This is true is necessary time to achieve all goals, now you’re working as freelance writer but it needed time and adjustments…but is so nice to say to yourself I’ve achieved it, so CONGRATS for your success, you0ve done a very very good job!!! This story is so similar to all the others I have heard from people who have been successful with their sites. They usually start with 20-40 hours of work each week above and beyond full time employment, and then when income becomes enough to replace some of the full-time income, the time spent on the side income becomes more and more until it eventually becomes a full time job. 99% of “overnight successes” come from months and years of trying to be successful both day and night!! Yes overnight successes are never overnight! Good advice! I’ve blogged (solely for fun) before there was even a word for it, and long before it became what it is today. I finally went and caved and purchased my domain name and space back in September and I have never worked so hard in my life. (This includes works 60+ hours as a middle school teacher). I AM a stay at home mom, who wants to homeschool, but like you, I refuse to tell my kids “in a minute”, so all my working gets done while they are asleep and/or napping (which means many, many late nights for me). However, I don’t want to go back to working 60+ hours a week. I read (A LOT) of books before deciding that I wanted to take my blogging to the next level. I love blogging (I always have) but I needed to go “professional” and take myself seriously. The amount of stats and people who think they can just “build it and they will come” are scary. Yes, I totally agree! Blogging takes so much work and really is hard to make profitable. I started my first blog probably about four years ago thinking that I would put it up and instantly make hundreds of dollars a month. Now I cringe just reading my posts from two years ago they seem so bad! And the other thing is that blogging is always changing. You think you’ve got something figured out and then it quits working. I’ve always was interested in doing a blog. I often feel intimidated but after reading your story I might give it a try. Very inspiring post Alexa! You’re living proof that hard work and determination is the only way to get the results you want. I’m just starting out on this blogging journey and I’m trying to have the thick skin to deal with rejection and stay persistent. There definitely isn’t a special sauce, but I’m truly passionate about what I’m doing for the first time and it feels great! Alexa, I just found you on Pinterest right now. I really enjoyed your post. I am not married, divorced or a mom, I am just out of work for the second time in my life. I agree that a college degree isn’t necessary but, unfortunately I didn’t realize that until I had returned to school. Now I have to pay for loans for a degree that isn’t paying off. I have often thought of starting a blog as a matter of fact, my final paper for school was “Ways To Start An Internet Business”. I loved doing the research but, I find that I lack the confidence that I could possibly have anything to offer to the world of bloggets or anyone else for that matter. Most of my experience has been in the legal field, I crochet and, I create greeting cards. I also enjoy drawing but, I don’t consider myself to be an expertin any of these areas. People are always inquiring about purchasing my projects but, I am really struggling with how to get things of the ground. Alexa, agree totally with all of the comments posted, you are very inspiring. Proof that working hard and being dedicated to what you do, can pay off in the end. I am literally in tears as I am at my work computer, on my lunch break. I wasn’t lucky to be married, but I recently broke up with my longtime boyfriend of 7 years, we have twin girls and a six year old together. He always took care of the rent, and cable, while i took care of everything else. Now I barely have room to budge with my budget. I barely make enough as it is. For the past several weeks I have dived in my computer, finding out how this blogging thing goes. I still have yet to get my own domain, but in the meantime I decided to start writing blog posts so that when I do start my blog, id have something to work with. This blog is everything for me and my situation right now. I just wanted to say thank you! Just found your blog and have been reading it all morning. I am a divorce mother of two and have been working two jobs for the last year. It’s inspiring to know that someone else has been though the same thing and has managed to make a good living for their children. Thanks for the good advice. This is great practical advise. I too kept my day job until I was secure in my own business. Starting slow, working smart and keeping expenses as low as possible are keys to success. Wishing you well! I have afternoons and weekends free and I especially need money. Holidays and Christmas. I have done office work before 50 years worth. I am single but not a Mom. Hope I qualify. I just want to say you are truly an inspiration to me. You’re also the first blog I’ve ever taken the time to comment on because you are real and you keep it real. It just seems nowadays people only want you to see the “perfect” parts of their life and not the actual reality of struggling. Thank you for being so personal and just being you, from one single mom to another! Have a great day! Good day. Thanks for putting yourself out there. I am stuck-in-a-rutt in my position working with committees and other administration. After nearly 11 years (by August this year) I feel like I am in a mid-life crisis and don’t know how to tell my boss. I also suffered a stroke two years ago. Have two children, husband works but earns less than me. I feel like I need a fresh motivation to support myself and my family and what better way to do so than with your own time, own money, don’t have to answer to anyone – you get the idea. I am planning on resigning but not without doing my homework first and finding what I really love to do. Can anyone relate? You Know what Alexa’s, i was with this legit and honest business, and i do not wish to say the name of this business, but it was some millionaire’s on that site, because i had became friends with one of them. well she saw that i was struggle, well that is because i have an mental illness call ADHD, and i was server Depression, because this job had just fired me for no reason at all so i did some research on this company and it had triple number 1 and the co-founder he was hating on me because you see i had been on this site for almost a whole year, in Dec. 2014, that’s when i first join, so i had got so excited that i had caught on, and once i did i had started helping others, because that’s is the type of person i am well this last time my Ranking was 2200 and in just 2 weeks my rank had drop down to 338 and they had me list under Author Leesa Lovett, and i told them to please don’t insult me like that, because i know that i wasn’t an Author well at least not at that time, but you see what i learn i share with the community, and that’s how my ranking went down so low, well and again i had been on that site for almost a year on and off, and then i had won this small settlement, and i was able to pay my tithes to my church first, and that made me fill so good, but i also do a lot of volunteering work for my Church, i help out with PADS that is a homeless shelter and we have it at our Church every Tuesdays, and i also help out passing food out to the needy on every third Saturday of each month. But i notice that something was happening to my site, and at first you see i was in an accident when i was much younger, and i had some more teeth put in my mouth, but i wanted some real implants so i had went to Clear Choice and he said that it was going to cost me $25,000 for a new set of teeth that was missing, and i needed a total knee replacement, because i had an infection in my front 4 teeth and that was all i had in my mouth other than my bottom teeth, well anyway i had came back bragging about how that i inspire them, because i said with the help of my LORD JESUS, I CAN ACCOMPLISH ANYTHING….. And then i had started notice that i couldn’t get into my e-mail, and then i had notice that all my banners was gone and then i kept asking this person how do i get backstage, since everything was missing and i had said how could anyone hate on a mentally challenge young lady, because i needed to get my knee replace, so all i could do is PRAY to my GOOD LORD, to take my pain away until i get a $1,000, because the doctor told me that he rather pull my 4 front teeth because if the Dentist, not intention pull my bone structure then i would be force to were denture for the rest of my life and Alex’a i was going to write a book about him, because i came from a middle class family because my Grandfather was a Preacher, but he had die when i was 5 years old. And i had wrote the three pages about me, and why did i want to get started and a pricey policy page, but this man he had block me everything that he could, and i said that my GOD is too GOOD, and i refuse to fall into a depression like when i had got fired on the 4th day at work, and i said to the agency you have to give me a good reason, because i said just because i had a mental illness i still know my rights, because i haven’t had a job in 5 yrs. And i had big dreams, because my mom taught me and my sister Morals, Principle and Integrity and she said the sky is the limit to what ever you want to be with the help of LORD JESUS CHRIST. And MY MOM IS SO RIGHT, BECAUSE I AM NOT GOING TO LET ONE MORE HATER GET IN MY WAY, So i had went to Church, disappointed of course. But i gave GOD all the GLORY and PRAISE, because he deserve it. And i refuse to let anything get in my way because one day i will earn the Leadership to be an Author.